It is entirely written by spirits. They have the entire control of this Paper. Hastings Center, Syracuse, NY. Publisher: Miss Keziah E. Prescott (1819-1886). Editor: Spirits of the Sixth Circle. 1/1, November 1852-October 1853. 16 pp., $1.00 a year. Noted in Hoggs Weekly (which calls it "another ghost organ") and in The Vanguard, 1852, and Telegraph Papers 4 (1854): 289. Emma Hardinge, Modern American Spiritualism (1870), 310, notes a letter from Jonathan Koons to the journal. The "Spirits of the Sixth Circle" who edited this may be connected with those of the same name who edited R.P. Ambler's Spirit Messenger, so the two journals may be connected in some way. The spirits' announcement of the journal and its intentions in its first issue was nothing if not all-encompassing: "We shall entirely manage the paper. We shall entirely control all its directions. We shall make known to its readers their duties as sentient beings before their Creator; we shall introduce into its columns the first principles of your being; we shall advance the most important rules for your enjoying that energetic, vigorous state of health which was designed for all to enjoy. . . . We shall instruct in morals for young and old; we shall make known upon its pages the whole duty of man to man; his whole duty as a manifest declaration of superior capacities, somewhat devoted to the enhancement of the amelioration of those who now suffer errors of multitudinous accumulation," etc. The spirits' corporate contributions were supplemented by disquisitions by the likes of the spirits of Lorenzo Dow and others, and letters from various spirits to individuals still in the body, all of which shared a revivalist, exhortatory tone. The fact of the spirits editorship of the paper created a problem for the Post Office when a woman to whom it was being sent refused delivery and the Post Master was faced with the conundrum of returning it undelivered back to the editors. 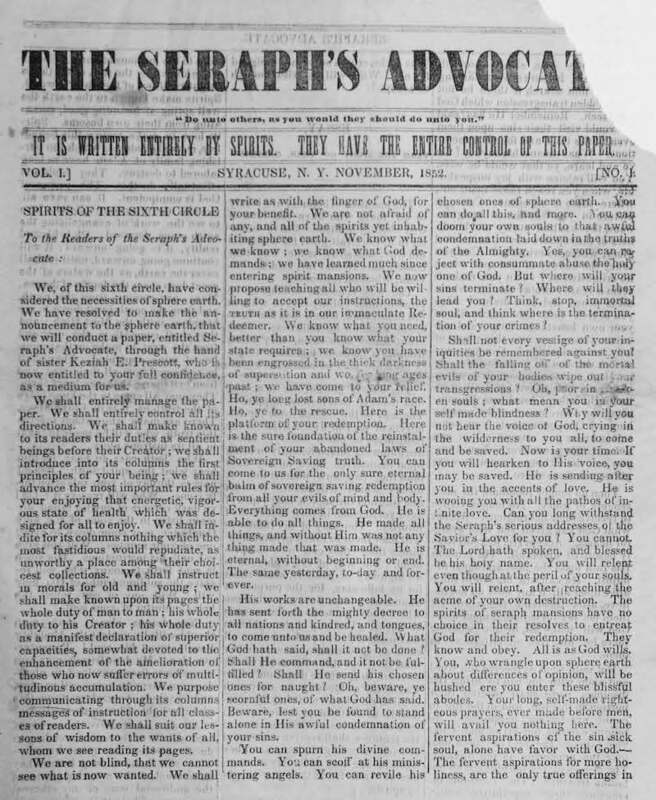 Adolf Bastian, Der Mensch in der Geschichte (Leipzig, 1860 ), 1:146, mentions a journal he calls the Seraphic Advocate in the same context as the Shekinah and the Spiritual Telegraph, which indicates that it was published in the early 1850s. It is possible that this is a mistaken name for this journal.